If you work in corporate America, I’m sure you’ve been to a few meetings like this. I can’t help it … could this be a metaphor for the Second Vatican Council, with Anderson representing the losing council fathers? When I was a child the Church everywhere had the same faith, the same sacraments and the same Sacrifice of the Mass. If anyone had told me then that it would be changed, I would not have believed him. Throughout the breadth of Christendom we prayed to God in the same way. The new liberal and modernist religion has sown division. hand they resist, but with the feeling of separating themselves from the Pope, who is our father and the Vicar of Christ. In both cases, what a heartbreak! Many priests have died of sorrow before their time. What a heartbreak, indeed. We face the same difficulties today. Something important has to “give” no matter the choice we make. It might seem that the archbishop sacrificed the principle of obedience to the Holy Father in order to preserve orthodox doctrine and liturgy. But did he really sacrifice obedience? Is the Holy Father truly served by obedience that so radically undermines the Catholic Faith? The “obedience” required of everyone at the time looked more like wild rebellion and infidelity. In most places it still does. It has been said that cloaking rebellion under the disguise of “obedience” was the devil’s masterstroke. Would-be critics of the archbishop and his actions first need to struggle with this reality before passing judgment. A blessed feast of the Annunciation to all. 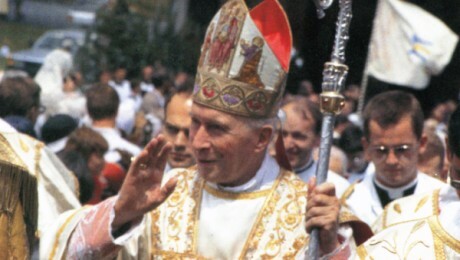 Archbishop Marcel Lefebvre died on this day in 1991. The Annunciation represents a glorious beginning, a new season of hope. It seems that Heaven wanted to emphasize a new season of hope in the death of this “great man of the universal Church”. Because of his work, all was not lost, the devastation was not complete, and there is hope for future generations. We who, 23 years later, enjoy the privilege of assisting at the ancient Latin liturgy owe Archbishop Lefebvre a tremendous debt of gratitude. He could have chosen another path. Obedience would have been easy. He could have kept his beloved Mass, his old fashioned spirituality, and perhaps even his priests and seminary for a time. He would have been praised universally for his humble obedience. He would have enjoyed the society of Rome and might even have been made a cardinal. He would have died in concord with the pope, without enduring the malicious taunts of “schism”, and without the bitter grief of “excommunicate” affixed to his name. He was precisely the kind of Catholic for whom schism and excommunication held the greatest terror. But then, if he had chosen this easy path, he would have left us nothing – and countless despairing souls would have been lost. Instead he placed the glory of God and the salvation of souls over his own good name and reputation. He chose tribulation over comfort, calumny over praise, and the death of an exile – “on the existential peripheries”, if you like – in order to pass on the treasures he had received. All of the canonically regular traditional orders owe their existence to Archbishop Lefebvre. All of the Ecclesia Dei communities owe their existence to Archbishop Lefebvre. Summorum Pontificum would not exist but for Archbishop Lefebvre. Indeed, the Society of Saint Pius X serves as perhaps the most salient check on Modernism in the Church, as they are virtually the only clerics who can speak out publicly without fear of reprisals. And yet, for all of these gifts, ungrateful men who should know better – men who are undeniable beneficiaries of Archbishop Lefebvre’s great sacrifices – continue to wage a relentless campaign against him and the Society he founded. It’s not enough for such men to disagree; they must discredit him entirely. They exhibit all the signs of envious souls who, lacking his courage, must assuage their bad consciences. The first thing to understand is that “religious adherence” is defined as those who identify with a church or religious denomination. It does not include everyone with religious beliefs. Nor does it represent attendance at religious services. For example, religious adherence in the United States is reported at 50.2% , while 42% attend religious services at least once per week, and anywhere from 71% to 92% (depending on which poll you believe) report a belief in God. Religious adherence would seem to be a good proxy for a minimal degree of religious commitment. The “light” counties seem to be concentrated in the western and northwestern states. It’s interesting to track how this plays out politically. Far northern California is the least religious area of the state, but also the most politically conservative. Idaho, Wyoming, Montana, and Arizona share this unlikely admixture. In my neck of the woods, the sentiment leans strongly libertarian which translates into GOP politics most of the time – a phenomenon that is common in the western states. The intellectual framework of libertarianism has always been atheistic, though some have tried to Christianize the movement. Despite the low rate of religious adherence in far northern California, I would guess that well over 60% of my neighbors believe in God – probably more than 80% once you get out of the city – and although they don’t identify with a specific religious group they are generally respectful of those who do. It’s interesting to observe that religious adherence doesn’t always translate into a virtuous society or culture. Witness Memphis, New Orleans, and New York City. Another surprise: there’s a lot of “light” in West Virginia, Virginia, and Eastern Kentucky. I typically think of Appalachia as very religious, but things seem to be changing fast. Now, that makes me feel better. California, which boasts 62% believing in “God or a higher power”, looks positively fanatical when compared with Great Britain, France, Germany, and Scandinavia! We’re doing slightly better than Spain; we seem to be on par with Italy and Ireland; and we’re a little behind Poland and Portugal when it comes to religiosity. Zippy Catholic has written an important piece explaining why the “pastoral exception” of communion for the divorced and remarried, as promoted by Cardinal Kasper and not-so-subtly endorsed by Pope Francis himself, is vicious cruelty, not kindness. Zippy is a thorough and comprehensive thinker, and his words don’t lend themselves to snippets or sound-bites, so please read the entire article. Let’s all take a moment to thank Our Lord for Raymond Leo Cardinal Burke, who isn’t going to be silent about the defections of his fellow cardinals from Christ’s teaching on marriage. He must be suffering a great deal at this time. You may remember the tragic but triumphant story of Thomas Vander Woude, who died while rescuing his son in 2008. This new video puts faces to the names. Lent 2014 is proving to be a severe trial for a couple of families we know. A mother of 10 is hospitalized with the painful effects of a debilitating auto-immune disorder. Another family is tormented by escalating mental illness. We are too far away to be of much help. Please pray for Mrs. B, Mr. C, and their respective families. Meanwhile, some of the best Catholics are so deeply scandalized by Pope Francis that they are considering leaving the Church pending the outcome of the October Synod. Others – including people I know personally – have already retreated into sedevacantism or the fever swamps of end-times prophecies. Pray for them, too, for the grace of perseverance. Rome is aware of mounting resistance among the orthodox clergy to the new direction of Pope Francis in which Catholic teachings, already besieged, are further marginalized to the point of irrelevance. Elsewhere in the blogosphere there is a dust-up over the legitimacy of criticizing the pope. Articles by Joseph Shaw, Patrick Archbold, Steve Skojec, Hilary White, Fr. John Hunwicke, and Chris Jackson articulate various positions on the “grown-up” side of this debate. My own apologia can be found here – Criticizing the Pope: An FAQ. Many people are asking what should be done if the upcoming Synod results in a papal decision to allow married Catholics who are civilly divorced and invalidly “remarried” to receive holy communion. That would include any scheme that reduces the annulment process to a “pastoral” decision by a parish priest. God willing, should we fail to avert such a disaster, there will be a few cardinals and bishops to whom we can look for guidance. But one thing is absolutely certain: this practice would be a sin, and Catholics cannot comply. My wife and I are often asked what we have done to raise a musical family. This is always slightly embarrassing because we didn’t really plan on raising a “musical family”, nor are we altogether sure why some children take to music and others don’t. Neither of us are musicians. Although Mrs. C. is fully Asian, she’s definitely not the Tiger Mom when it comes to music lessons and practice. Our children will also attest to the fact that we have (ahem) less-than-perfect parenting skills, and in some respects a non-ideal home life. But it turns out that we did raise what most people would call a “musical family”, and so I thought it might be helpful to share our family’s approach to music. It’s definitely not the only way, and perhaps not even the best way, but it has met with some success. 1. An educational philosophy that “music is curricular, not extra-curricular”. From the beginning, we were convinced that music is an essential component of a liberal education. And so we began with the attitude that music is not primarily something one does with “free time”, or something that (like other hobbies) must always be “fun” and “enjoyable” to be worthwhile. Rather, music is studied because it expresses the good, the true, and the beautiful; and because the knowledge of music enriches the whole man. Furthermore the lives of the great composers, the histories of famous and important works, and the influence of music on society should also be studied. Knowledge and competence comes first; the enjoyment comes later. 2. Respect for parents. This is a huge topic, and I’m not qualified to write the book, but children who don’t respect or obey their parents are not generally very teachable. Just paying for lessons isn’t going to help much. And getting them to practice is going to be a constant battle. So, it’s important that children be raised from the beginning with a healthy respect for their parents. 3. Home education. This not only gives a family lots of flexibility in terms of music lessons and event scheduling, but it can help children avoid unproductive and harmful distractions. Almost 50 percent of our city’s youth orchestra is home schooled. 4. No television. Our decision to live completely TV-free has eliminated one major distraction and a fierce competitor for the children’s free time (although now we have to fight with computers, etc.). 5. Exposure to good music. We’re not convinced of the “Mozart Effect”, but our children’s exposure to the best kinds of music – primarily sacred, classical, and folk music – begins in utero and continues throughout their childhood. 6. Limiting bad music. Certain genres of “music” are actually anti-musical. They erode the patience, calm, and mental discipline that is necessary to learn the art of real music. And so we have always tried to maintain a tight control over the kinds of music we allow in the home. Our children have not become addicted to rock music or any of its derivatives (rap, hip-hop, heavy metal, etc.) – what Professor Alan Bloom called “America’s drug of choice”. There are exceptions, but it’s rare for an electro-music-addicted young person to find anything appealing about classical piano or violin, or even traditional folk music. You might make him study it, but when he wants a musical diversion, he’ll always choose the passive stimulation of rock music before picking up the fiddle or sitting down at the piano. 7. Musical siblings. Having one or more siblings who also study music has a great many benefits, both tangible and intangible. They need each other, they help each other, and they play together. 8. Musical friends. There were, in fact, two families who inspired us when our oldest children were very young. We saw their beautiful enjoyment of music and wanted the same kind of joy for our family. Later on, we were blessed to have the friendship of one family in particular whose children were also musical, and with whom our children enjoyed playing. 9. “Yes” to music. All parents must say “no” to their children often enough. We decided early that we would try to say “yes”, whenever possible, to our children’s musical aspirations. That means sacrificing time and money for concerts, competitions, rehearsals, workshops, master classes, new instruments, and special trips of all kinds that were “above and beyond” what was minimally required for their studies. 10. Love and a happy home. I don’t like the Tiger Mom’s approach. It may result in good musicians sometimes, but I’ve talked to numerous people who resented that kind of upbringing and have dropped the music. There must be love in the home, and a genuine desire for the good of the children as opposed to parental or family prestige. Children can sense when your motives are off. Spend time talking about music and listening together, but don’t make an idol of it. At the same time, the laissez-faire approach is also mistaken. There needs to be firmness and discipline, especially in the beginning, at least for a minimal effort, and without any fear of occasional unpleasantness. 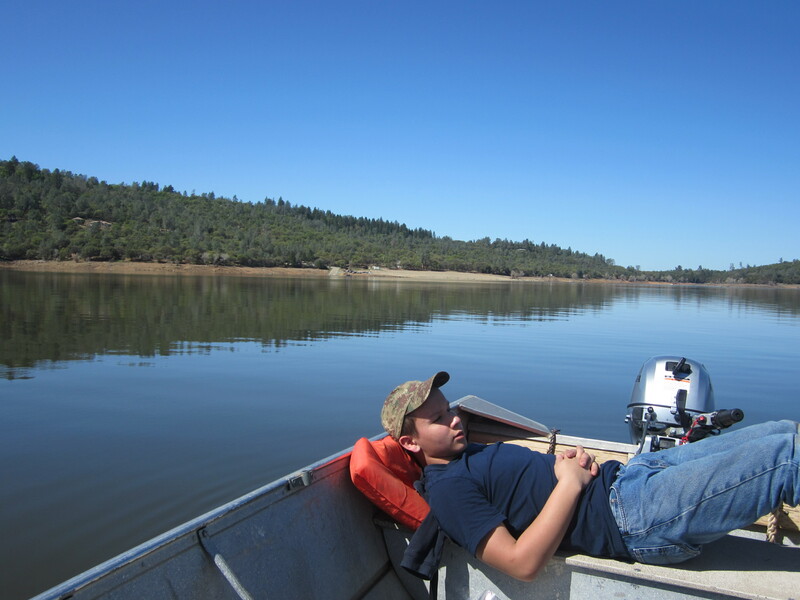 My middle son joined me for a day on Collins Lake. I was a little nervous letting him drive the boat, but he did a great job and put the old man at ease. 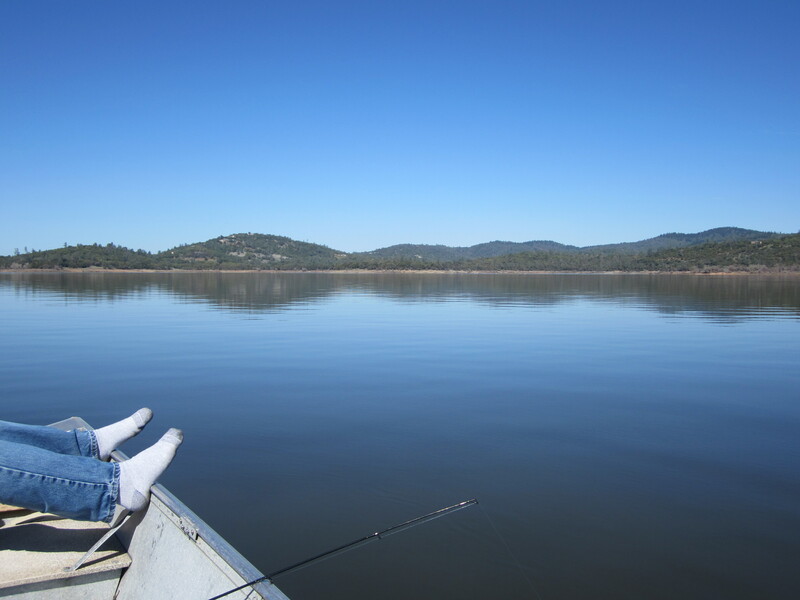 The scenery, the wildlife, and the quiet waters were a welcome respite from the “big city” bustle of Chico. We’re both burnt to a crisp. His burn will turn into a tan, he assured me. Mine will turn into cancer. 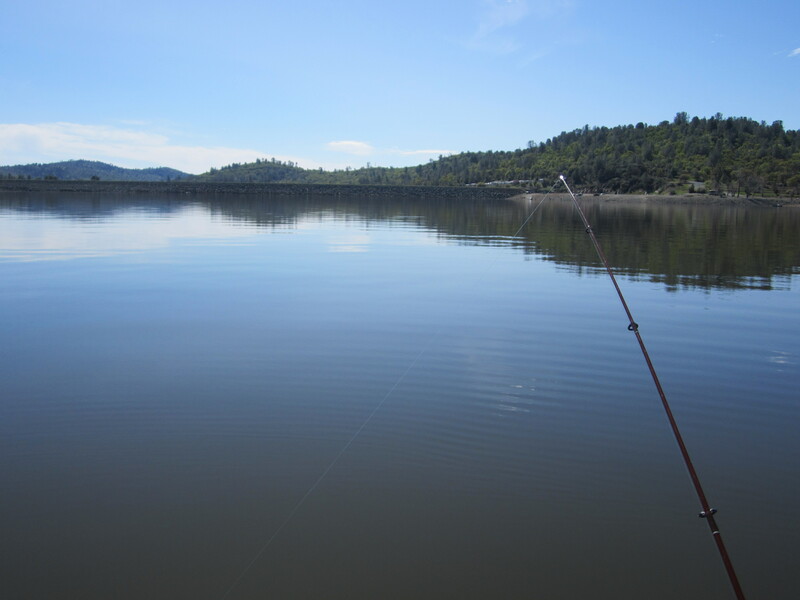 Don’t ask how the fishing went … this was only a trial run!